While Foodie Pen Pals rules state that you should post what you received on the last day of each month, Lindsay asked us all to post our September goodies on October 1 rather than September 30 since the blog world tends to be a little dead on weekends. This month, I sent my package to Sabrina and received a package from Erika. Erika is a much better foodie pen pal than I and sent me an e-mail with all sorts of prompting questions about my likes and dislikes (will totally be stealing that for my next round of foodie pen pals). She also asked if there was anything else she should know, so of course I told her it was my birthday in September because, as I think I’ve established, I’m obsessed with my birthday. So I got a lovely card! Erika also knocked it out of the park on the card. She included descriptions of everything she sent me! A+ work. I managed to keep my paws off the granola for a whopping 8 hours before diving in — mostly because I was sleeping during those eight hours 😉 . I’m not gluten free, so this is a purchase I never would have made for myself. It’s pretty tasty, though I’m still not sure how I feel about corn flakes in my granola. I currently have an only-slightly-used jar of blackberry preserves in my fridge, so I haven’t tried these peach preserves yet, but they look amazing and a jar that size will last forever. I’m pretty excited 🙂 . I tried one of the Dulces Mexicanos on my birthday, and it was an interesting experience. The outside of the candy is somewhat papery and unlike anything I had ever tried, but the caramel inside is delicious. Thanks for all the great food, Erika! 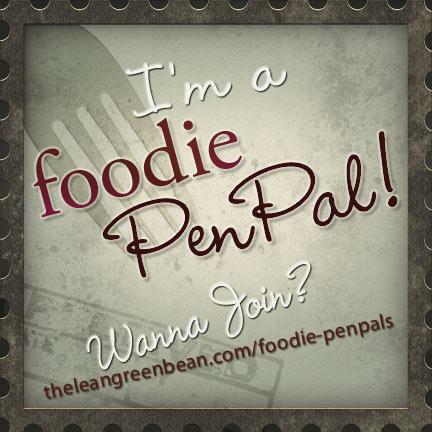 This entry was posted in Foodie Pen Pals. Bookmark the permalink. This is such a cool idea! I’ve seen this around for a while but have been hesitant to sign up (I have no clue why). I probably should just bite the bullet and do it! Do ittttttttt. Pretty sure getting awesome food you never would’ve bought for yourself is the greatest thing ever!